We are lucky George Ziets managed to leave a strong mark on the world of CRPGs during his adventures at Obsidian Entertainment. Were it not for his phenomenal work on Mask of the Betrayer, perhaps we would not have seen him as a double Kickstarter stretch-goal superstar. Regardless, here we are with Ziets taking on both Project Eternity and the world of Numenera, and we couldn't be happier. Mr Ziets, being no stranger to taking questions from random people, was the perfect candidate for an RPG Codex feature. In this interview, we ask him about his approach to game design, his influences, ideas, writing, and of course the games he has been involved with in the past (including NWN2: Mask of the Betrayer and the upcoming The Elder Scrolls Online) and present (Project Eternity and Torment: Tides of Numenera) -- and perhaps future. You've mentioned that you were hoping to get a chance to work on some of Project Eternity's area design in addition to your various writing duties. Has that come about? Did you have any personal design philosophies or ideas you were hoping to bring to that particular arena? PE is still in preproduction, so that hasn’t happened yet. I’ve mainly been contributing to world and story design. I think of area design as another form of storytelling. So the first thing I do is determine the central narrative of the area. What story (or stories) are we trying to tell? And what kind of setting or atmosphere are we trying to convey? Once those questions are answered, I have a context, and everything – main quest, side quests, NPC chatter, etc. – should arise from that. Even the smallest details can (and should) be used to communicate story and setting, so that the area feels like a unified whole. Baldur’s Gate 2 generally did this well. When I traveled to each of the major areas (Umar Hills, De’arnise Keep, etc. ), I felt like I was entering a coherent side story – a self-contained D&D module - where all the dialogues and quests were focused on telling the area’s story and/or the player’s own. That’s what we tried to do on MotB, too. I look at quests through a similar lens. Every quest is an opportunity to explore another facet of the narrative. We should use them to deepen the player’s experience of the area’s story and setting and explore how different people/factions would react to the same events. I don’t think we should ever have to resort to “generic” quests in a well-designed RPG. Is your creative process in any way affected by simultaneously writing for both Eternity and Torment? Have you had any problems managing your ideas? For instance, that one project bleeds into another? Are there things that would work in Eternity, but that would absolutely not work in Torment (or vice versa)? Not really. The two worlds are very different from one another. Despite its exotic nature, Torment feels closer to science fiction or post-apocalyptic fiction to me, especially to Gene Wolfe’s New Sun series. Eternity, on the other hand, is firmly rooted in fantasy and historical traditions, and in my opinion, it feels closer to the Forgotten Realms or the Malazan Books of the Fallen (with some notable differences). RPG Codex: First of all, congratulations on your new writing gigs. 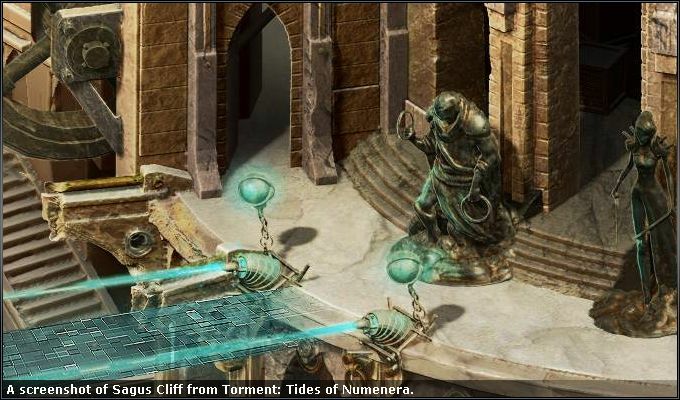 Many of us here at the Codex are very much looking forward to both Project Eternity and Torment: Tides of Numenera. Tell us a bit about yourself. How did you got into creative writing and game design? How did you end up as a stretch goal for not only one, but two spiritual successors to some of the most acclaimed RPGs of all time? Ziets: I’ve been doing game design and creative writing – in some form – since I was 9 years old. I’m old enough to remember the original D&D red box, which was my introduction to role-playing games, and as soon as I got my hands on those books, I started designing my own adventures. Probably should have played more professionally-made modules first, but it’s more fun to learn by doing. After that, I spent years writing D&D adventures for my friends, building worlds to play them in, writing (usually terrible) fantasy fiction, and designing rudimentary RPGs with Stuart Smith’s Adventure Construction Set. I still see those years as my apprenticeship in game design – I never would have been prepared for a job in the industry without them. 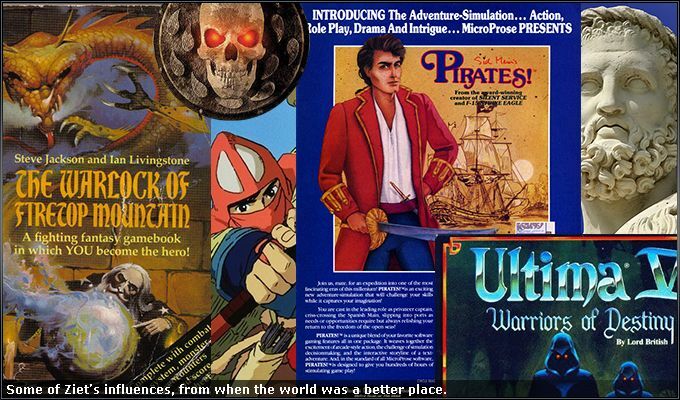 Working in the industry was fun, but the games that I *really* wanted to make were RPGs in the style of the old Infinity Engine games. 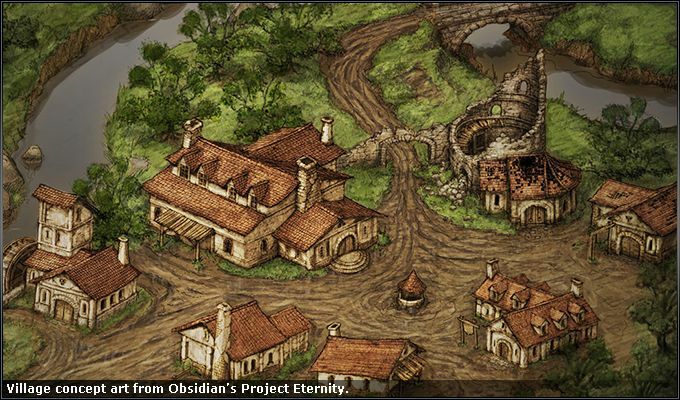 I got into the industry a little too late for that – they were already winding down in the early 2000s, and I wasn’t able to break into an RPG studio (Obsidian) until 2005. As far as I could tell, NWN2 was the closest I’d ever get to the IE games, and for all its faults, I loved every minute of working on that title. MotB was even more fun because I got to write the story for a real D&D CRPG – which still blows my mind when I think about it too hard. Both Project Eternity and Torment: ToN were successfully crowdfunded. You are free from the pressure of publishers and any external creative control (besides whatever input you allow from the fans). How do you plan to exploit this? What are some of the things you've 'always wanted to do' – big or small – that were stopped by powers above or beyond you? I’m not in charge of either project, so it probably won’t be me who’s making those decisions on PE or T:TON. For example, if it was entirely up to me, we’d have turn-based combat… which in itself is something that a Kickstarter can do that most publisher-funded games currently cannot. Building a fantasy world that doesn’t rely on the standard Western European tropes (e.g., elves, dwarves, medieval tymes). This is typically shot down due to fear that the project won’t appeal to a large enough audience. If a fantasy world employs a different set of “familiar” elements, I don’t think this is necessarily true, but… I haven’t had a chance to prove that yet. Writing a personal narrative, rather than a “save the world” story. I think there is a perception (rightly or wrongly) that players need to feel like their adventure has higher stakes than just their own story. Personally, I disagree, as long as the player’s story is set in the midst of exciting events and lets the player do cool things. Even Planescape: Torment tried to set up larger repercussions of the Nameless One’s story, though I think the game would have been just as cool without them. Making a game in an unfamiliar genre. A while back, I had a great Formspring question that listed a bunch of literary genres and asked which ones I thought would be good for a game. That’s exactly the sort of thing we should be thinking about as developers, but publishers rarely greenlight games that don’t fit the standard models. I’ve seen some great pitches (like an urban fantasy that I didn’t write but really liked) that should have been picked up but instead went nowhere. Designing unusual companions. 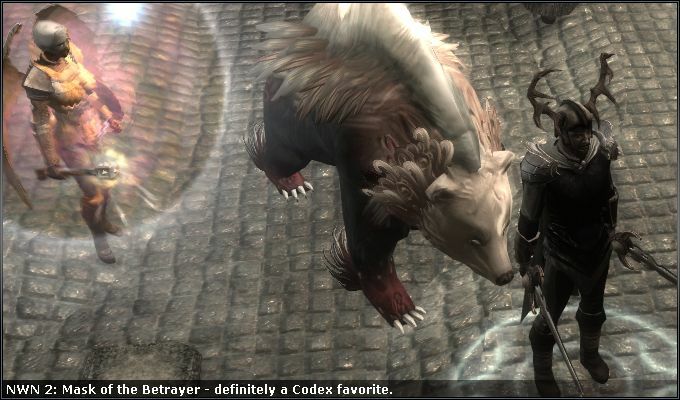 I was allowed to create whatever crazy companions I wanted on Mask of the Betrayer, but this is pretty uncommon. Usually, companions have to be standard humans/humanoids. Why? Probably fear of alienating consumers. Turn-based combat, as mentioned above. When Obsidian was (briefly) working on Baldur’s Gate 3, the design team spent a couple days putting together a proposal for a turn-based combat system, but it was dead on arrival. It wasn’t considered viable for a mass market RPG. Before being stretch-goal'd into Eternity, you said (on formspring) that a smart decision made by Obsidian was to go with a Mature rating, because of their writers being at their best when they can address complex and adult themes. Does this apply to yourself as well? Have you ever felt constrained writing for a Teen rating (Dungeon Siege III)? Hmm. I don’t think I’ve ever written for an M-rated game, apart from a few months on Fallout: New Vegas. I think it’s possible to explore dark themes without venturing into M-rated territory – you just have to be a creative about it. Your creative role working on Project Eternity includes writing on a conceptual level and laying many of the foundations of the setting. But what is your role working on Torment? You were added as a stretch goal promising to add 'more depth and reactivity'. Will your work on Torment be more object-oriented, in that you perhaps write a character, a quest-line, or something similar? There's a great Iron Tower Studios interview in which you talk very candidly about the harm caused by the over-ambitious scope and lack of focus on Neverwinter Nights 2 – 'the team tried to do too much in too little time, and everything suffered a bit' – and laud Kevin Saunders' more conservative approach to designing Mask of the Betrayer. Given that you're now writing for two RPGs which have promised up-front to deliver some pretty extraordinary, even unprecedented amounts of specific content (Project Eternity, for instance, has promised at last count two Athklata-esque cities, a fifteen-tier dungeon, at least eight companions...) and which have set themselves relatively short development cycles, how are you feeling about the collective workload on both projects? Haha! Well, we’re still in preproduction on both of those projects, so I can only trust that the producers have scheduled everything out as well as they can and concluded that it can all be done. On a purely instinctual level, I agree that both projects feel ambitious. Ask me again in a few months. Judging from your work and what you have written on formspring, you seem to have quite an interest in epic level campaigns and especially the concept of godhood. Is this an accurate observation? How do you approach the designing of a pantheon or divine mythos? It’s somewhat accurate. A lot of games start the player in a low-magic, familiar setting and gradually ramp up the magical elements as the game moves forward. I think that’s a valid approach, but personally, nothing makes me more likely to quit the game / shut off the movie / close the book than a scenario I’ve seen a hundred times before. I’d rather start the player in a new and exotic place and keep tossing surprises at them until the end of the game. Planescape: Torment does that. 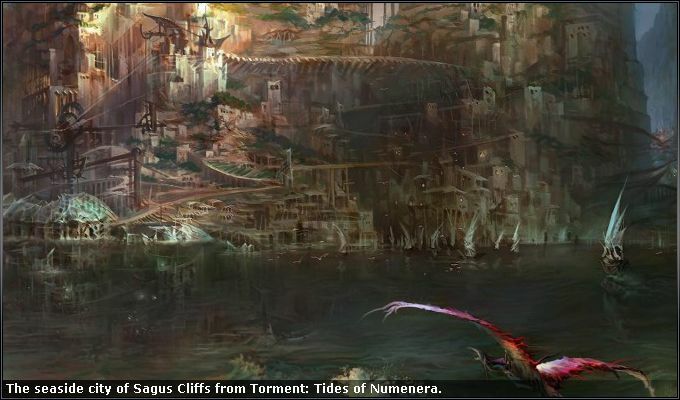 Tides of Numenera is going to do that. And that’s always the kind of game I’d rather play. Godhood isn’t necessarily my focus, but it’s a means toward that end. Also, I’ve never really seen a divine-level CRPG before, so I think it would be fun to design one. How do I create a divine mythos? First, I try to think contextually. Cultures create gods for the things that are most important to them. So what matters most to the people of this world or culture? Are they nomadic aurochs-herders or sophisticated renaissance-era imperialists? What’s unique about this world or culture and how are people’s concerns different from the real world? What values or needs do they have that are alien to us? Create a god or gods for world-specific elements, and your pantheon will feel more distinct. Also, I try to give a twist to the standard archetypes. I wish I could tell you about other PE gods, but take the example of Woedica. Many pantheons have a ruler of the gods whose rule is relatively unquestioned. So I took our queen and cast her down from her throne. She’s not in charge anymore, and no one respects her authority. But she still stands for laws, even if the other gods don’t follow them. In fact, if anything, she’s even more zealous about defending her laws because, well, they represent her right to rule. Then I followed the track of her resentment to arrive at her other spheres of influence - vengeance, retribution, memory, hierarchies – things that might obsess a dethroned queen. You have on a few occasions mentioned Baldur's Gate 3 – how you'd love to work on it, as well as laying out ideas you have for it. Project Eternity may the closest we'll ever get in terms of a 'spiritual successor' to the series, and there's no direct continuation of Baldur's Gate in sight. Would you still consider Baldur's Gate 3 as your 'dream project', even with Project Eternity happening? Absolutely. Well, it’s one of my dream projects, anyway. And I still think that a sequel to the BG series is a possibility. I have my own ideas about how the Bhaalspawn’s story could be continued in a divine-level campaign, which I’ve described on Formspring. Personally, I’d love to play (and work on) that game. But if BG3 is ever made, it’s more likely that it won’t be a direct continuation of the Bhaalspawn story. When Obsidian briefly started work on BG3 in 2009, we were planning a narrative that took place some time after the Bhaalspawn crisis, and the main character was not the same as in the original series. I can’t say much more about it, but we discussed a number of ways to connect that narrative to the original series, and I think we could have found a clever way to make it work. 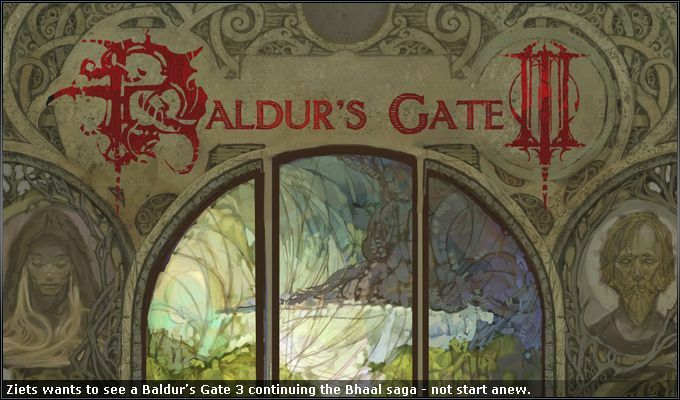 Hopefully a BG sequel would have at least some connection to the original games, apart from the location… though I’ve seen proposals that had nothing to do with the Bhaalspawn at all. You contributed writing for Fallout: New Vegas. What are your thoughts on the Wasteland from a creative writing point-of-view? What are its strengths and weaknesses? If you were to design a new Fallout, where would you like to take the series? For a writer, Fallout is a thematically rich environment. It’s a little bit like Lord of the Flies, putting people into an environment where all the societal constraints on behavior are removed, and we can imagine what people would *really* be like. Does conventional morality persist? Do people just try to survive, or do they attempt to build society anew? Is it even possible to start fresh, or will we always end up in the same place, with the same problems and mistakes? Those are some of the themes that interest me, but I can think of many more. What else is great about Fallout from a writer’s POV? Humor. It’s baked into Fallout’s DNA. You don’t have to worry about dropping a joke into an otherwise bleak experience and jarring your audience. Fallout tolerates serious human drama, satire, or outright goofiness better than any other post-apoc setting I know. On top of all that, Fallout exists in a fictional version of the “real world,” which allows us to make references that everyone understands. We can build upon the audience’s existing knowledge and use concepts and ideas from Earth’s history as a basis for our stories – e.g., Caesar’s Legion, the Rat Pack, Army Rangers, etc. This is a powerful tool. If you’re building a world from scratch, you have to establish the factions, locations, popular culture, etc., and then hope the player knows what you’re talking about when you name-drop some “famous” person in dialogue. But in Fallout? You can have a guy dressed as Elvis and before he says a word, the player makes all kinds of useful connections that you can utilize… or subvert. The downside of Fallout? Well… true to its opening monologue, Fallout never changes. A century or two after the bombs fell, people are still scavenging for junk in ruined supermarkets, living in bombed-out shells of buildings, and most of the world still looks like a dull gray wasteland. The survival game isn’t all that compelling to me anymore. What I do find interesting are all the tribes and factions – Great Khans, Twisted Hairs, New Canaanites. Where did they come from, how do they survive, how do they relate to one another? So if I could design another Fallout game… I might not design a traditional RPG at all. 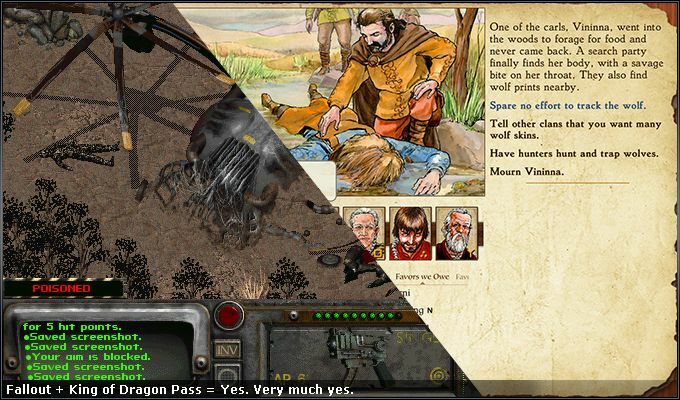 Instead, think of a strategy-RPG hybrid like King of Dragon Pass – set in the Fallout universe. You’re placed in the role of the tribe’s leaders, responsible for establishing a home base, keeping your people safe and fed, exploring the surrounding wasteland, and managing relations with other tribes and factions. During your time away from Obsidian, you spent some time writing for The Elder Scrolls Online. How was that experience? What are the strengths of the Elder Scrolls settings? Also, similar to the previous question regarding Fallout: if you held the reins on a new Elder Scrolls adventure, where would you like to take it? In 2008, I was Lead Quest Designer for Elder Scrolls Online. We were in preproduction during that whole period, so I didn’t actually design any quests or write any characters. 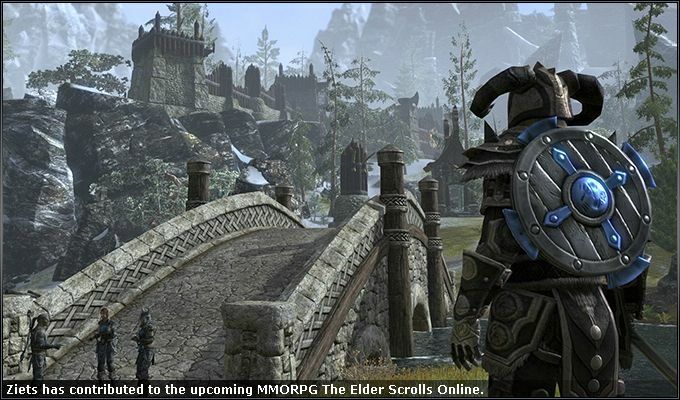 My time was spent laying the foundation for the game – developing the main storyline and provincial storylines for each race, designing major characters and faction leaders, writing backstories for the alliances, determining the state of the TES world during the earlier time period, and working with the artists to create visual style guides for the races, characters, armor, architecture, etc. I don’t know how much of that stuff is still in the game - the main story has changed a lot - but I did notice that they’re using some of the characters I developed (the Tharns, Skald King Jorunn, the adventurer-queen of Summurset, and possibly others). Overall, I enjoyed my time at Zenimax. The team was much smaller then, and the designers were a tight-knit group – we played board games together every Friday and got to know each other well. Todd Howard and his team at Bethesda had to approve our story and lore, but they were easy to work with – it was a much smoother experience than many I’ve had. Ultimately I decided to return to traditional RPGs, but only because I enjoy that genre more. Elder Scrolls’ greatest strength, in my opinion, is its lore. If you dig into the lorebooks, you’ll find a world that’s subtle and deep, full of gray morality, ambiguity, and sophisticated myths. In TES lore, truth is subjective. Nobody knows what *really* happened in the past, but every fictional author has their own opinion or interpretation, which feels a lot more “true” to me than the authoritative encyclopedias that we see in other games. Plus the disagreements and differing interpretations set up conflicts between factions in the game, which is best illustrated in Morrowind. Recent installments of TES haven’t fulfilled the promise of the lore, in my opinion. I understand why they’ve moved away from the subtlety of Morrowind – to appeal to the mass market – but I think the audience can handle more subtlety than many developers believe. My approach to a TES game probably won’t surprise anyone. I’d take the player to someplace they’ve never seen before – preferably to one of the regions that doesn’t resemble Western Europe. Someplace that sets up the player as a stranger in a strange land. Maybe Elsweyr, Valenwood, or Black Marsh… or even across the sea to Akavir, which supposedly has monkey people, vampiric serpents, and may hold the secrets of the Blades’ origins. I think a story of exploration and first contact (e.g., using the East Empire Company) could be fun, and it’s something I rarely see in RPGs. How would you describe the 'Ziets approach' to game design? Which designers and writers have influenced you the most over the years? What’s unique about the medium of games is its interactivity. A game is really a shared narrative between the developer and the player, and the more we can do to make the player an equal partner in that exchange, the better. So my goal as a designer is to make the player feel like the most important character in the game… and to give the player as many ways as possible to customize their experience. Examples: Let the player decide who their character is and was – avoid imposing an identity upon the character if you can. Provide multiple ways to solve every problem, make sure the player is aware of their options, and provide clear consequences for the player’s choice. When important events happen in the story or world, they should result from the player’s actions, or they should play out differently because of the player’s choices. 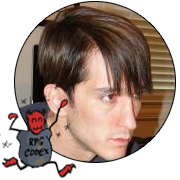 Anticipate what cool thing the player would want to do in any given situation, and try to find ways of letting them do it. Make your villains threaten things that are important to the player - not just to NPCs. And never impose words or actions upon the player in a cutscene (or anywhere else). Another important goal is to think of all elements of the game as part of a coherent whole. No element – gameplay, story, art – is more important than any other. They all need to work together to create a unified experience. Ideally, we should approach every game with a high-level idea of what kind of experience we want to craft and then make sure that the story, mechanics, and art style all reinforce that big idea. This perspective can be difficult to keep in mind at mid- to large-sized studios, where disciplines have become increasingly specialized, with one person doing nothing but combat design, another doing nothing but writing and story, another focused entirely on items, etc. This is one of the reasons I favor the older system of designers as generalists, which tends to encourage us to look at the whole experience, rather than one specific part. Finally, I always prefer to put the player into a situation where they don’t know the rules. I’m not referring to game mechanics (which should always be clear and understandable), but to the story and the world. If you can drop the player into an unfamiliar situation that isn’t quite like anything they’ve seen or experienced before, they’re going to be more attentive and engaged, leading to a more memorable experience. Everyone likes a mystery – the key is to use plenty of unanswered questions about the setting, the story, and the characters to drive the player through the game. Influences are tough. I’ve ingested such a mixed-up cocktail of games, books, movies, and TV over the past 30+ years that it’s difficult to pick out the ones that have had the greatest effect on me as a designer. What are some of your all-time favorite RPGs, and how do you think the games of today hold up? Do you have any thoughts on the recent surge of 'classic RPGs' being in production: Might & Magic X, Divine Divinity: Original Sin, Chaos Chronicles, Shadowrun Returns (just to name a few)? All my favorite RPGs date from 10 years past or longer: Baldur’s Gate 2, Planescape: Torment, Arcanum, the old Quest for Glory games, the “middle Ultimas,” etc. Temple of Elemental Evil would make the list for its combat, but I have trouble getting past the writing – which, as a fan of the old D&D module from way back in the day, makes me sad. ToEE could have been so much more. I always forget to mention these, but another set of favorites are the old RPG-strategy hybrids, which combine my two favorite genres. Specifically, I’m thinking of games like King of Dragon Pass, which I mentioned earlier, another title that deserves a spiritual sequel. Also a really old game called Sword of Aragon, which few people remember. I’m a huge fan of the surge in classic RPGs... I wish I could work on more of these games at once. Many of the planned RPGs seem to be emphasizing turn-based combat, which is still a pleasant surprise to me. Not two years ago, I thought turn-based combat was dead. The emphasis in our industry was on fast action, first-person shooter hybrids, and Facebook games, and it looked as though there was no room – and no real demand – for anything else. One of my colleagues and I would decry the decline of RPGs over our weekly Indian buffet, and we genuinely thought we were the last of a dying breed (the Codex notwithstanding)… but fortunately, we were wrong. Do you have any aspirations to create something outside the realm of games? 'Writing a novel' seems to be on almost every writer's bucket list. Interactive storytelling is still my favorite medium. I’d much rather create a story and a world and let the audience experience them on their own terms, make their own choices about them, and see how those choices change their experience. Probably that’s because I got my start in storytelling as a DM, which is an inherently collaborative experience. If I was ever to write a novel, it would have to be something other than a western European fantasy. I don’t think I’d feel inspired enough to write a fantasy novel unless I went to a completely different kind of setting. It’s the same reason I chose to set Mask of the Betrayer in Rashemen and Thay, rather than the Sword Coast. I need to feel like I’m exploring a completely new world alongside the player or reader. A thousand thanks to George Ziets for answering our questions!